Out of the box, a brand new Mac can do a lot already without having to download and install tons of apps. It’s the little things that make Macbooks or iMacs a great thing to work with. The new Spotlight search and the multi-touch trackpad are my favorite features that make me love my Macbook Pro so much. Although OS X offers a lot of features without extra applications, there are tons of apps out there that can improve your Mac experience a lot. So, if you just got a new Macbook from Santa or you’re looking for new apps to make your life easier, you’re in the right place. Be aware that most of the apps do cost a couple bucks. I’m pretty sure, though, that you won’t regret paying for any of them. This small app lives in your menu bar and it’s only purpose is to prevent your Mac from going to sleep. 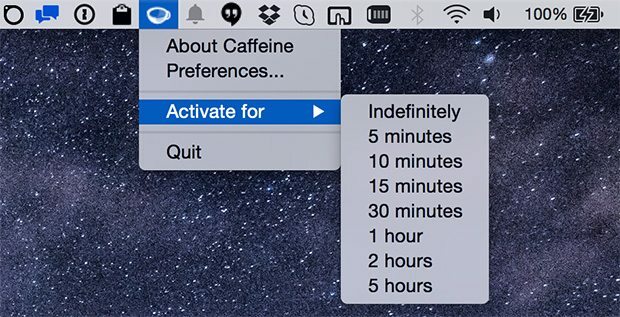 So, whenever you have a download or process running that shouldn’t be interrupted, then you can turn on Caffeine to keep it awake for a a few hours or until you manually turn it off again. I wrote about Current a while ago and called it “the best way to use Facebook on a Mac“. Now, after using it a little longer, I must say that this statement is still true but only for people who use Facebook Chat a lot. Current is a native Mac app that lets you access your notifications, chat messages and friend list. Probably the best feature is the chat window that you can use to talk to your Friends. This way, you don’t have to go back to your Facebook browser tab all the time to reply. 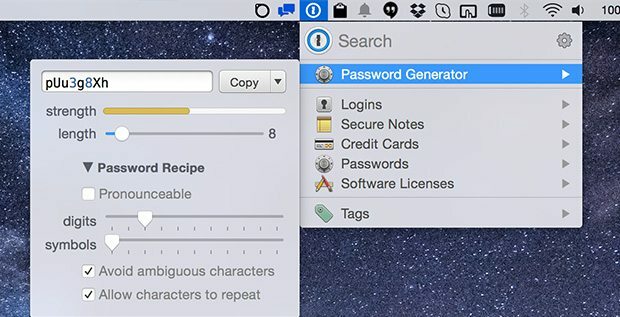 1Password is hands down the best password manager tool you can get. The price tag of $49.99 might drive people away but, after trying out other tools like Dashlane or KeePass, I finally decided to give 1Password a try. Trust me, it’s worth the money! It’s extremely convenient to use and offers great features such as Dropbox syncing. Plus, I think the security of your most important online accounts is worth more than 50 bucks. Check out their video to see how it works. This is a simple app but can be such a great help when you’re writing something or just working with text in general. 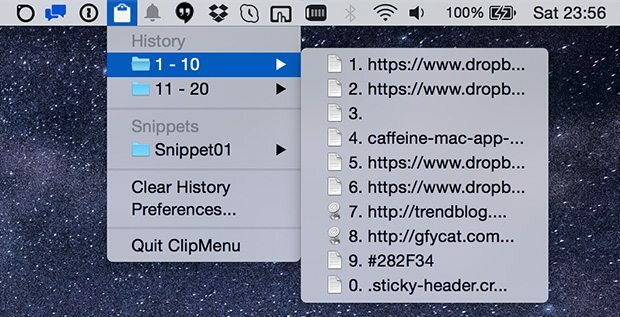 ClipMenu manages your clipboard history (all the stuff you copy with cmd+c). So, whenever you’re copying a few things but need to use something you copied a while ago, simply open up ClipMenu from your menu bar and select the text you need. Free storage or disk space on a mac is something that most people don’t have enough of. Having a huge SSD in a Mac comes with a price, so a lot of people go for 256 GB (or even 128GB) of storage space on their Mac’s SSD. This means that you need to manage your files and downloads well to prevent a full drive which slows down your Mac significantly. 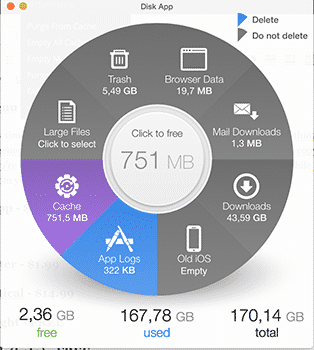 Disk App is a great tool to help you do that. 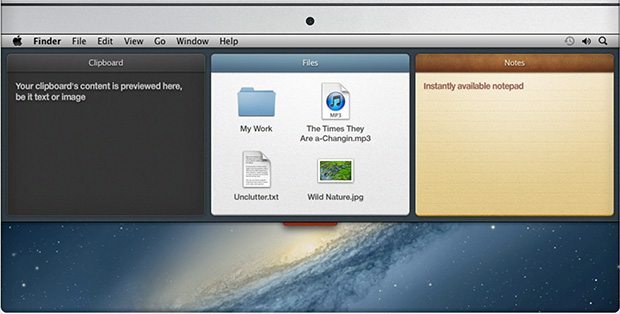 It scans your Mac and shows you how much space various file categories thake away. You can take action by deleting entire sections such as your cache or old iOS files. You can also go through your biggest files and select the ones that can be removed. By using this tool regularly, you can make sure that you only have necessary files on your machine. >> Download Disk App here. Unclutter claims that is a “digital wallet” to store your stuff and they’re right. It let’s you quickly write down notes, store files so that you’re desktop stays clean and it saves your clipboard history. You can do all that by moving down the Unclutter interface by moving up your curser to the menu bar and then slide down with two fingers. Of course, there are other apps to take down notes like Keep and you can just use a folder to dump stuff into, but Unclutter takes away a few steps out of this process and is, therefore, a very convenient tool. Update: For a limited time only, you can get Fantastical for $14.99. 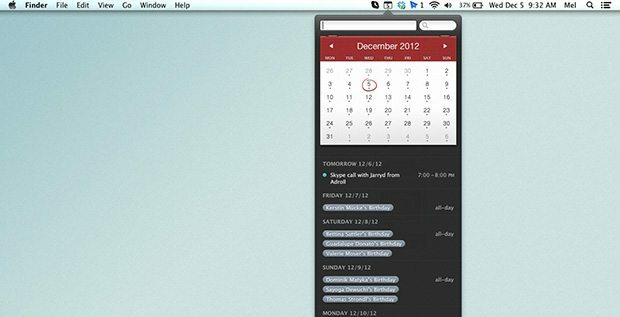 Fantastical is a great alternative to Apple’s native calendar app. It can be accessed easily from your menu bar and you can create new events or reminders by typing in things like “Conference call with Alex and Theresa tomorrow at 11AM” or “Remind me to call dad tomorrow at 8PM”. The good thing is that Fantastical supports the same reminders as OS X which means that you don’t have to deal with two separate to-do lists. Since it’s quite a steep price for a calendar app, you can download a trial version through Fantastical’s website to see if it’s worth the money. Update: Laplock cannot be downloaded from the official website right now, but you can still get it here. What’s one of the most annoying things that can happen when you’re working on your Mac in public places like a library or Starbucks? Yes, having a full bladder. Do you have enough trust in humanity to leave your Mac unattended for a few minutes? Hell no! So you either take it with you to the toilet or you wait until you’re done working, go pee and then leave. Laplock is an alarm tool for exactly those situations. Whenever you have to leave your Mac for a short while, you can turn it on and get an SMS the second someone unplugs your Mac’s power cord. On top of that, Laplock will trigger a loud alarm sound to scare off that bad guy who thinks he can take away your Mac. If you write a lot on your Mac, then you might get distracted by all the formatting options of Word or Pages or by all the open browser tabs. iA Writer doesn’t care about formatting or a lots of options. The only thing it cares about is letting you write without any distraction. You can use special characters like # and * to transform a line into a headline, make a word bold and so on. This formatting will be saved in the file and can be imported into other programs like Word. 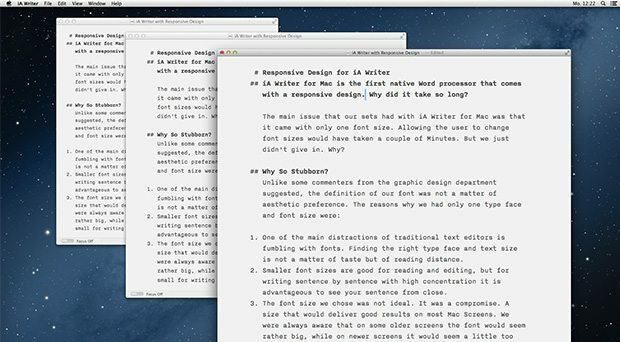 So, if you love to write on your Mac and need a distraction-free text tool, then you should really think about investing a couple bucks in iA Writer. >> Download iA Writer here. 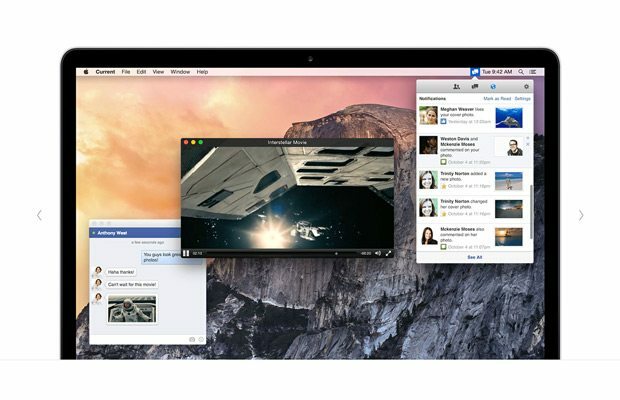 Do you know any other applications that any Mac owner needs to have on his machine? Let us know in the comments!